The stars were out, despite a torrential downpour, at the 2013 Cannes Film Festival. The Great Gatsby opened the festival, and all eyes were on Leonardo Di Caprio, Carey Mulligan and the rest of the cast as they navigated the rain-soaked red carpet in tuxedos and evening gowns. But as luck would have it, the real stars of the evening proved to be the logoed umbrellas that each of the cast members carried to protect their designer clothing. The humble umbrella typically is a low-profile accessory. But at Cannes, it took center stage, appearing in every picture the paparazzi took of Hollywood’s most glamorous and beautiful matinee idols. 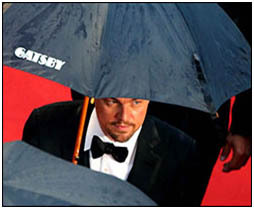 The Great Gatsby umbrellas carried by the film’s stars were provided by an international promotional products distributor, who works with communication agencies all over the world. Typically the agency orders promotional products as part of a full marketing package for the movie companies. Though umbrellas typically don’t play a leading role in a brand’s marketing budget, all bets were off when the Gatsby umbrellas ended up in the hands of the film’s leading man. “When someone like Leonardo Di Caprio touches a promotional product, it turns into gold at once because the item will be seen on TV and in many magazines,” a distributor spokesperson said. And indeed, nearly every photo of every star that walked the red carpet at Cannes features celebrities carrying large black umbrellas with their branded logo prominently displayed. As for the umbrellas, one word of caution: Carey Mulligan reportedly got hit on the head by one of the umbrellas as she got out of her car – although that also got press coverage and was recorded by TV cameras, garnering additional attention for the umbrellas.